With afternoon tea week starting tomorrow now is the perfect time to treat yourself. 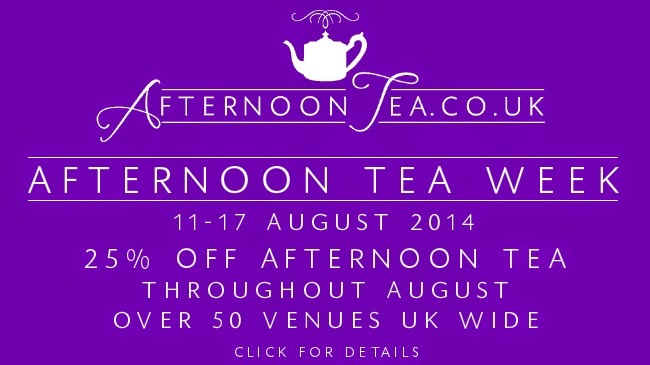 Afternoontea.co.uk is offering 25% off 50 participating venues when booking with them throughout August. We have teamed up with Afternoontea.co.uk and Nudge PR to bring you a fantastic competition to win a great prize! How many venues are listed on afternoontea.co.uk? Kate and Chelsie, We need Afternoon Tea Week in the US. Afternoon tea is what I do, it's who I *am*! :D So few places serve it, but I try to get them to see the wisdom of starting!